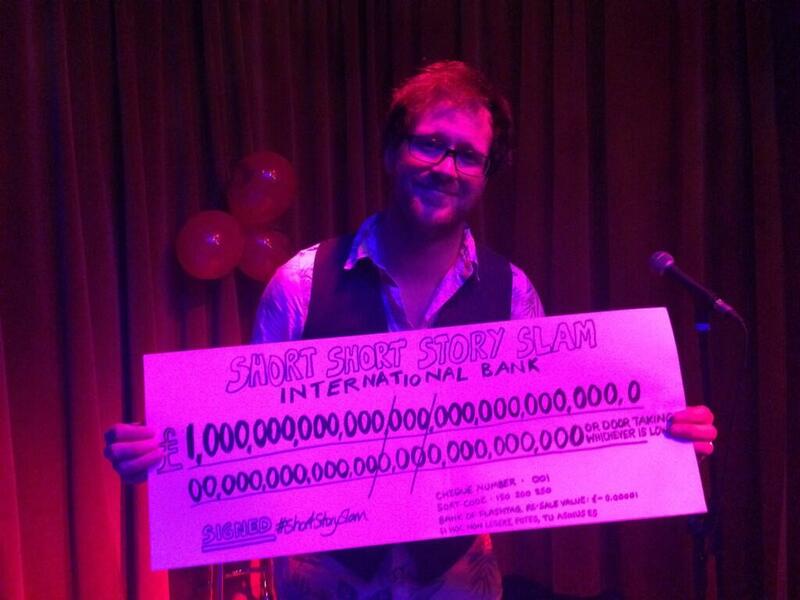 After a wild and wonderful night in Manchester, I’m bowled over to report that I somehow managed to win the Flashtag Short Short Story Slam. It’s still sinking in, but I’m delighted. It was something of a journey – we left Dora with her grandparents, and drove down from Cumbria in the afternoon. Mon and I met friends Steve and Clare in the Northern Quarter, ate in the revelation that is V Revolution, then headed across the road to Gullivers to scope the venue: a brilliant space of worn floorboards and ornate plaster ceilings. The stage was bathed in blue and red light, creating corners from which the writers would prowl to read their stories. For the first round, competitors were paired off at random, with names plucked from a bowl and a coin toss to decide who read first. Once each writer had performed their story, the audience voted blue or red to decide a victor, and that writer continued to the next round. It started ferociously, with the amazing Joy France reading an intimidatingly strong story about cleanliness (and willies). Her opponent was good, but that story would have annihilated all comers. I was very, very glad I hadn’t been drawn against her. She was duly voted through, and set the bar for the rest of the night. The stories were consistently excellent. Hand on heart, there wasn’t a bum note. Mark Mace Smith and Mark Powell, Joe Daly, Abi Hynes, Sarah Stuart, Geraint Thomas, Trisha Starbrook, Thomas Jennings and Ailish Breen all read absolute belters. My name was drawn in the fourth bout. I read a piece called What I’ll Do To Be In Love With You, about a boy who turns into a harmonica. I was anxious, as always, but I’d been practicing, and I made myself take the time to enjoy it. My opponent was Thomas Jennings, who read a brilliant piece about the end of the world as experienced through last orders in a MacDonalds. It was a funny and affecting story, and I would have been happy to lose to it; but I scraped through into round two, where I was paired off with Mark Mace Smith. Mark is a vivacious slam poet who often performs under the name Citizen Mace – check out his stuff here – and he made for another tough competitor. I was up first, with a story called Charlie Loved The Circus. This is a 200-word nasty about why you shouldn’t be mean to clowns. Mark’s piece was a sweet wee story about a man falling – literally – for a girl. Another close vote, but I made it to the third round. In the final, I read against Mark Powell and Joe Daly. Both are stalwarts of the Manchester literary scene – Mark runs Tales Of Whatever, and Joe is one half of Bad Language – and their stories were excellent. I was last to read, and went with a story called The Jubilee Best Bake Competition. I always planned to read this with an accent, but bottled it at Verbalise. So I bought a frumpy hat onstage. It’s made of green wicker, has a broad brim and is covered with flowers. Once I’d donned the hat, I couldn’t back down from the accent; and so I launched into my idea of what happens when the village baking competition takes a turn for the worse. The audience (joined, at this late point, by three exceedingly stocious men who thought they’d come to a boxing match) kindly gave me some laughs, and that helped me relax into the story. The hat helped, too. The vote was tight again, but I sneaked it. I’m still thrilled, delighted and surprised – as well as humbled and happy to have shared my stories with such an amazing crowd. 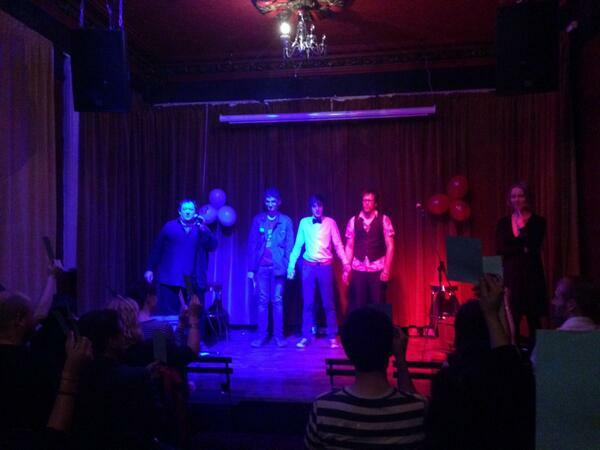 We stayed for a couple of hours after the slam, happily chatting away with the Flashtaggers, audience and contestants. It made me wish, once again, that I’d made more of the astoundingly vibrant Manchester literary scene when I actually lived there; then again, I’d barely started writing when we lived in Withington. It was after 11 when we left Manchester, and we drove a deserted motorway in the dark. The journey gave me time to think. I’m over the moon to have won, but there are two things that burn brighter. Firstly, I won’t forget the sense of community I experienced at the slam; it’s a real thrill to share my love of stories with friends and strangers, and events like the slam are a howl of affirmation that stories are alive and people are hungry to share them. Secondly, and quite honestly, I would have been proud to have been knocked out at any point, from round one onwards. This is because, for the first time, I read my stories the way I want them read. I used to gabble or murmur my way through a reading. A year or so ago, I set out to be better. I haven’t shaken the nerves, but I’m learning to manage them, and I’m coming to trust my stories. I’m not a confident person, but running a gauntlet of open mics has given me some confidence in my work. Back at home in Cumbria, I tiptoed in to see my daughter. She snuffled in her sleep, and buried herself in the blanket. All journeys, no matter how big, are measured in stages and steps. For all the things I would change about myself – to write more often, to be more focused, to perform better – I wouldn’t change a step of the path I’ve taken to where I stand now. Here’s a picture of me with a cheesy grin and my cheque for £1,000,000,000,000,000,000,000,000,000,000,000,000,000,000,000,000,000,000. I’ll be cashing this tomorrow, Flashtag – if there’s any trouble at the Post Office, I’ll be back with my bat.